1. Line a 1 litre pudding basin with clingfilm. Add the dried fruits, spice, brandy and orange zest to a food processor and blitz until a sticky purée forms. Stir in the almonds and spoon the mixture into the basin. 2. Press the mixture firmly into the basin, making it as compact as you can. Any air pockets trapped can cause the pudding to crumble and not slice neatly. Smooth over the top with a spatula, then loosely cover the bowl with a tea towel and leave to dry out and set for at least 3 days in a cool, dark place. 3. 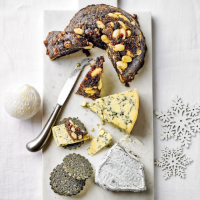 When ready to serve, turn the pudding out onto a cheeseboard and remove the clingfilm. Decorate with bay leaves and redcurrant sprigs. Serve in thin slices with cheese and crackers. This pudding can be kept in the fridge for up to 1 month. This recipe was first published in Thu Dec 08 12:46:00 GMT 2016.